Walk into the GED test confident and prepared. 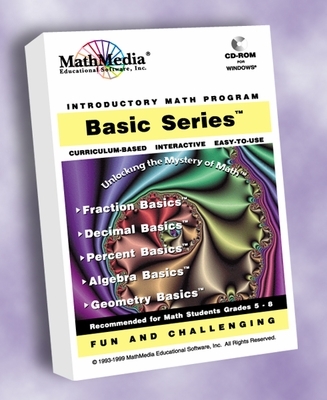 Use the "Basic Math Series" set of five programs to prepare for the GED Test in mathematics. Master the "Basic Math Series" and you will be prepared. 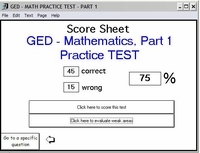 Want to take a practice GED Math Test? 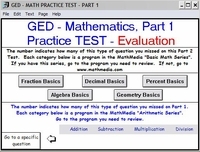 Then, scroll down and purchase the Basic Math Series WITH the GED Math Practice Test component. 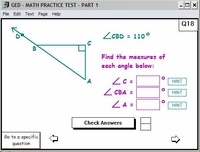 The GED Mathematics Test has 50 items. Of these, 40 are multiple-choice format, and 10 are grid format. Half of the Mathematics Test items are based on graphics. The Mathematics Test is 90 minutes in length. Part I is administered first. Each candidate is provided the test booklet for Part I, a calculator, and scratch paper. At the end of 45 minutes, the calculator and scratch paper are taken up. The test booklet for Part II is then distributed with new scratch paper. If the candidate completes Part II in less than 45 minutes, he/she may return to Part I and complete that section; however, the candidate must do so without the aid of a calculator. A page of math formulas is provided for reference during the test. The Mathematics Test has two parts, each with 25 questions. Part I allows the use of a scientific calculator; Part II does not. 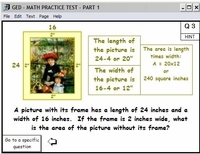 The Mathematics Test includes 10 grid questions in which students plot their answers. On the standard grids, students “bubble in” numeric answers. On the coordinate grids, students plot points on a coordinate graph. Multiple sources of data are required to solve some of the questions. Some questions ask students to identify a correct method for solving a problem, rather than to find the correct answer. Score each question or score the whole test!